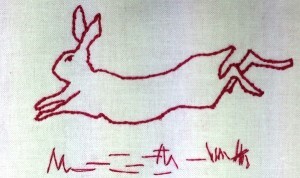 What a great entry point into the world of embroidery. 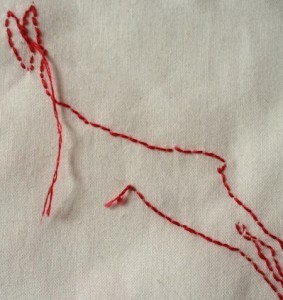 Such a great way to learn some basic stitches, one stitch at a time. No wonder Redwork was taught to very young children. Maybe that say’s a lot about me? A child at heart, through and through, and I like simple clear lines. It amazes me how much can be conveyed by a single line. Like the stag just paused, listening and looking, in the moment before a decision to sprint or to stay. 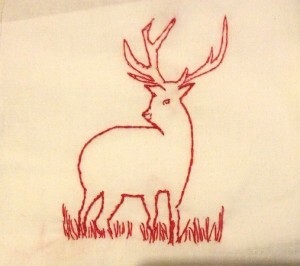 I have had a great deal of fun over the last few weeks developing some wildlife based Redwork designs. It’s neater than I thought. 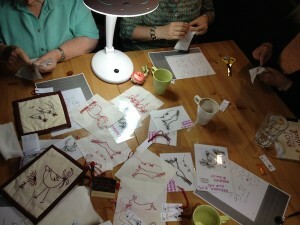 I ran a workshop at the Chapel Gallery to introduce the genteel art of Redwork. We had a great evening, lots of chatter, moments of easy quiet while people concentrated and people leaving, inspired to create something new at home. 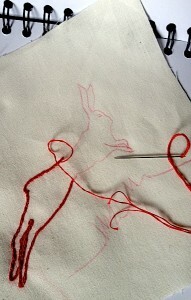 Some are planning to try stitching a grouse, another a pretty, thoughtgul saying for a 21st birthday gift. I *love* unlocking creative doors. I almost daren’t admit it but Yarndale approaches, and I am transforming the designs into new ‘Madbird’ kits so that others may have a little dabble in Redwork. Doesn’t he remind you of Peter Rabbit escaping from Mr Mcgregor’s garden in Beatrix Potter’s tale? 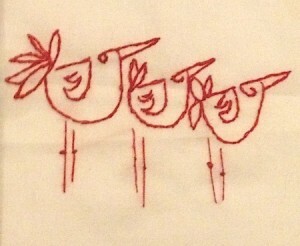 I shall leave you with my ‘Three Madbirds’. I’ve no idea what’s caught their attention, but I need to get on with making up kits and finishing quilts ready to adorn my stall at Skipton Auction Mart at Yarndale in late September. 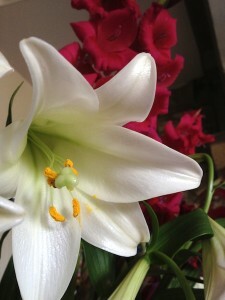 PS I just had to share these beautiful flowers with you.